Unbreakable Kimmy Schmidt’s fourth season begins with a playful parody of a 90s-style comedy opening sequence, Kimmy playing the goofy, affable protagonist in a cheery world scored to a song by Jane Krakowski. Of course, that bright and silly world comes crashing down before the actual intro, Kimmy’s broken record player providing the literal record scratch. The way Unbreakable Kimmy Schmidt plays with television tropes and meta comedy is impressively still fresh and smart in these moments. "Kimmy Is...Little Girl, Big City!" The show spent its first couple of seasons proving its premise could work and then opened the story up to the other characters, putting them on equal narrative ground as Kimmy. Now, the show is so sure of its comedic voice, which makes it all the more immersive. And it has a crystal clear thesis that has transcended its initial premise, too. The end of season three and the beginning of season four reiterate that this show is about people finding their purpose in life—and often failing and changing course along the way. 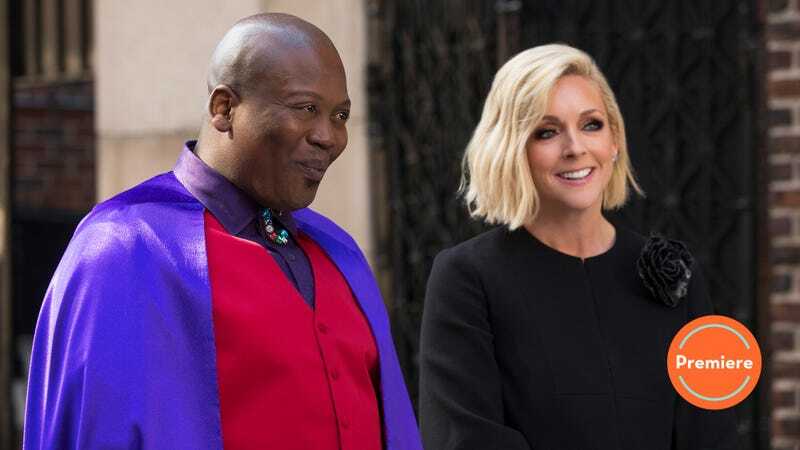 Jacqueline and Titus’ quests to find their purpose remain married: Jacqueline has taken him on as a client for her talent agency, White Talent (Jacqueline not realizing what that sounds like reminds me a lot of Jenna Maroney created a lifestyle website called Jenna’s Side). Titus still wants to be a star but mostly so he can win Mikey back. And he ends up going about it in his usual Titus ways a.k.a. lying. Jacqueline and Titus come up with a fake show that he’s starring in called The Capeist, about a superhero vigilante (“super strong crimes fighter, according to Titus) who also owns a cape shop. Naturally, they end up in over their heads when Mikey starts asking too many questions. Unbreakable Kimmy Schmidt manages to follow fairly predictable sitcom beats but then still surprise by taking things to an extreme, hilarious, unexpected place by just channeling its extremely specific sense of humor and over-the-top world. Titus and Jacqueline end up having to stage a fake episode shoot and rope Greg Kinnear into it. Kinnear has some fun with playing himself, open to helping Titus by letting him punch him in the face because he loves that it’s for love. It ends up being a very funny, very Titus plotline, but there’s also deeper meaning at play. It’s hard to watch Titus lie to and manipulate Mikey, especially since Mikey is so dang earnest and excited about Titus’ success. And if past character development between these two is any indication, there will likely be serious consequences later on. Attempting to get some closure from Artie’s death, Lillian tries to fulfill his final wishes by spreading his ashes at his old summer camp on the Lower East Side, but she arrives to find it has been turned into a members-only Soho House-style club. This leads to a series of fun bits for Carol Kane, who tries to get in the club by dressing as a stipper and then as Cyndi Lauper, but the ultimate visual punchline falls flat (dead stripper jokes are pretty much never funny). Unbreakable Kimmy Schmidt has wavered in the past when it comes to justifying Lillian’s presence on the show and making the character more than just a kooky old lady who says outlandish things from time to time. But placing Lillian in this larger story about gentrification, age, and change has led to great character development and a much deeper story than meets the eye. Her subplot in the premiere refocuses on that narrative. Strangely, Kimmy almost feels like an afterthought in her own show in this premiere. Kimmy’s plotline, in fact, is easily the weakest link. She’s still working as the HR director at nebulous millennial startup Giztoob, and when her boss asks her to fire an employee, she tries so hard to make him feel comfortable while firing him that she ends up accidentally sexually harassing him? On a surface level, the storyline works in terms of character development and what we already know about Kimmy: She often wants so badly to help people that she ends up hurting them or forcing her own way of life and thinking on them. A consistent thread between the characters of Unbreakable Kimmy Schmidt is that they all have trouble seeing beyond themselves. In Kimmy’s mind, she’s a fun-loving, T-shirt-gunning good time, but when the perspective flips to her coworkers, it turns out they’re all pretty much terrified of her. Not everyone operates on her happy-go-lucky level, and Kabir is right to feel violated by her actions. But the specific details of how this story plays out are off-putting. It’s a storyline about sexual harassment that doesn’t really say anything about sexual harassment and, to put it bluntly, it’s not the right time for that. Making a joke out of Kimmy’s naivete in this way misses the mark, especially since Kimmy herself is a victim of sexual abuse, which the show has acknowledged from time to time. Wedging in some commentary by way of Titus about how there’s an overdue reckoning happening in terms of calling out sexual harassment doesn’t end up doing the storyline many favors, making it even harder to parse out exactly what the show is trying to say here. It’s not a terrible misstep, but it does seem less thought out than the rest of the premiere, which is otherwise a strong return for a show that consistently (and successfully!) makes a case for its own longevity. 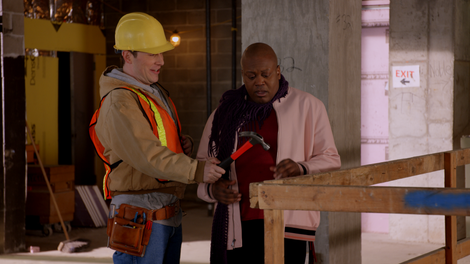 Welcome back to coverage of Unbreakable Kimmy Schmidt! We’re doing things a little differently this season: Reviews for all six episodes of the front half of the season will publish hourly today. So binge away! Titus’ reaction to Ray Donovan: “Who or what? !” His delivery of both that and his pronunciation of “Ray Donovan” are exemplary of Tituss Burgess’ brilliant comedic talents. Also, his reaction to C.H.E.R.Y.L the robot/friend/lamp after she says “men, right?” proves he can play off of literally anything. Titus and Jacqueline both calling a computer a “contuter” is just too good.